Hi there! Sorry that I haven't been keeping up with my blog, but the time just keeps flying by so fast! 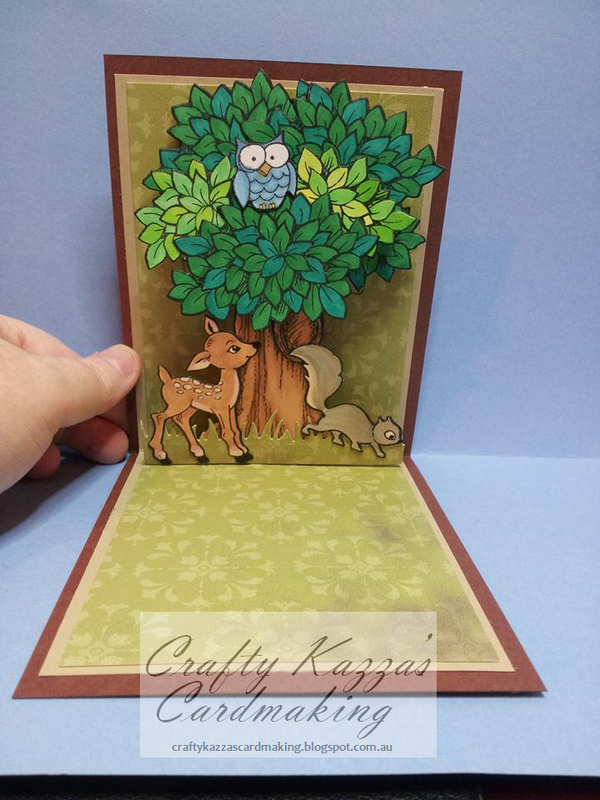 I jumped in quickly to share with you a card that I made using some of the supplies I spoiled myself with at the Brisbane Scrapbook and Papercraft Expo 2015. Seriously, I did some damage to the credit card, but it was my 40th so I figured I would only be 40 once. Maybe I'll get to splurge again like that on my 50th! lol. Anyway, among my spoils were various sets of stamps and dies from Stampendous. I made my first pop up card using their special pop up die and the forest set. Here is a link to their website if you want to check some of their products out. I think they're in America though. Several boo boos were made during this card, but I really love how it turned out, I hope you do too! Well I'll try to pop in now and then, but until next time, stay crafty!